More than 200 walkers took on the challenge of walking “the MS Mile” to raise funds to tackle the condition. £4,500 was raised by the participants who walked around town on the morning of Saturday September 23. Launched by the deputy mayor councillor Mark Willis, the walk raised funds and awareness of the Chilterns MS Centre - an independent local charity that supports people in the community with multiple sclerosis. Abi Parry, who lives and works in Aylesbury said: “I was diagnosed with MS in 2016 and found out about the centre the day after my diagnosis when I saw fundraisers collecting for the charity. “Every step of the way I have received great support and advice and just talking to other people who are going through the same experience is a great help. 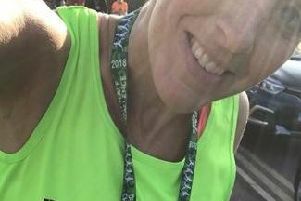 “I managed the walk 10 minutes faster than last year so I was absolutely delighted, there was a really great atmosphere. Hannah Asquith, head of fundraising and communications at the centre said: “We were delighted that the Deputy Mayor opened and joined the walk. “As well as raising vital funds it was also about reaching out and spreading the word. “We believe there are still people with MS in the community that don’t know we are there and how we could support them. The hundreds of people that have walked the mile for the charity this year will help it deliver hundreds of hours of treatment to individuals like Abi who rely on the centre. Although it costs the charity £1m to meet the needs of people with MS in the local community, it receives less than 10% of its funding from the NHS so it is reliant on donations and fundraising initiatives such as this.